The stylish Caesarstone is one of the most popular kitchen products which can be put to different uses in your new kitchen. The hard wearing surface of Caesarstone is made from natural quartz aggregates, enhanced polymer resins and organic pigments. 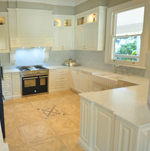 Caesarstone can be used to transform your kitchen space to something you have always dreamt of. The virtually non porous surface of the Caesarstone is perfect for kitchen benchtops because it keeps the kitchen worktop clean and safe from germs. The Caesarstone is also available in a variety of stylish designs and colours which means you can enhance the aesthetics of your new kitchen effortlessly with Caesarstone benchtops. The heat resistant and waterproof surface of the Caesarstone also makes it a great choice for the splashbacks in your kitchen. They can shield your kitchen from water stains and burn marks and ensure long lasting protection. One can also choose wall panels made of Caesarstone to complement the style of your home.